Links - Mazda Sportscar Club of Washington Inc. 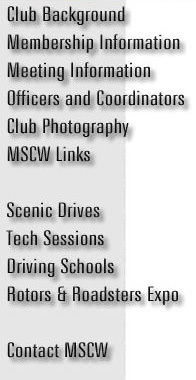 Note: The Mazda Sportscar Club of Washington, Inc. does not endorse any of the following businesses or private individuals. We provide these links as information. Attention MSCW members - If you would like a link to your own web pages or have submissions for the club pages, Email: Bill. Roy Wagner's Scenic Drive Page including pictures and special drive-related information. Miata.net - anything and everything you want to know about the Miata MX-5 can be found here. The Wankel Engine - a very informative section on what powers the RX and other series cars. The North American Motorsports Pages - Richard Welty's site which includes an extensive collection of track maps and other information. Others? Mail Bill for link consideration. This site is owned by Mazda Sportscar Club of Washington. 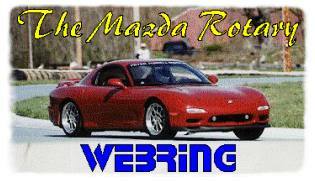 Want to join The Mazda Rotary Webring? Click here for info. Want to join The Miata Ring? Click here for info.